We're very excited about being in the GUNKHOLING business moving forward. It's both one of the best things to be part of and probably the item that tends to elude many people on a quest for fun on the water. If you want to know more about GUNKHOLING, look no further - we are going to have lots of fun together. GUNKHOLING, according to Wikipedia is a boating term referring to a type of cruising in shallow or shoal water, meandering from place to place, spending the nights in coves. The term refers to the gunk, or mud, typical of the creeks, coves, marshes, sloughs, and rivers that are referred to as gunkholes. Because of the slow pace, this type of cruising is best enjoyed by those cruising by sailboat or trawler. While not necessary, gunkholers typically seek out the serenity of isolated anchorages over the crowds of marinas and popular bays. We hold that gunkholing embodies the ultimate cruising lifestyle - it's one of those rare experiences that is best enjoyed slowly and deliberately. Gunkholing is the type of cruising that makes our coast one of the best locales on the planet. 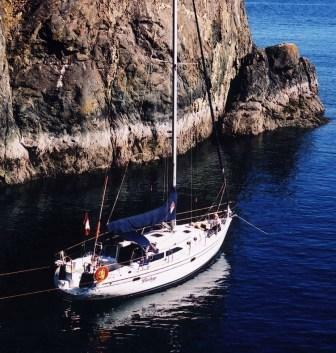 Some prefer to conquer oceans; we thrive on a good cup of coffee in a peaceful anchorage or quaint marina. Some would spend days and days aboard; we prefer a shoreside adventure such as a hike under the canopy of our coastal rainforest. Some brandish their swords as they battle other boats on a race course; we prefer to raft up to our fellow boats and make a few new friends. > Flashing the barbeque up after a day of cruising from one island to the next. know it to mean so much more. Won't you join us so we may properly introduce you to GUNKHOLING? Whether it be calling the 'easter bunny' over the vhf, doing a giant 'conga line' of boats through fog or just hanging out for some great chatter while testing the capacity of some poor cabin or cockpit - flotillas are where it's at.